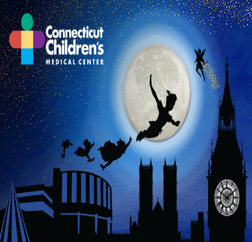 We invite you to celebrate the spirit and imagination of Connecticut Children’s Medical Center as the 2018 Gala whisks you away to storybook London! Enjoy a reception in Hyde Park, and dinner, live music, and dancing in Neverland. Most importantly, your support helps Connecticut Children’s provide exceptional care to children and their families all year long. The Peter Pan-inspired evening includes a reception and silent auction at 6:00 p.m., and dinner and an exclusive performance by Catapult, the world’s premier shadow dance company at 7:45 p.m. At 8:35 p.m., there will be a live auction, followed by dancing and live music by Shaded Soul at 9:30 p.m. Peter Pan will bid a fond farewell at 11:00 p.m.